Travel is an experience that enlists all five of our senses. Yet, traditional guides are dominated by sight and mapped out based on what there is to see. 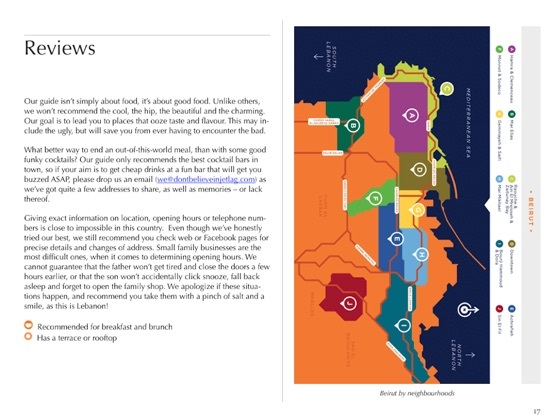 Tired of this worn approach, sisters Leonore and Olivia Dicker fused their passion for food and travel to create The Food Guide: Beirut on a Plate, an urban travel guide that allows you to discover Beirut through your palette. 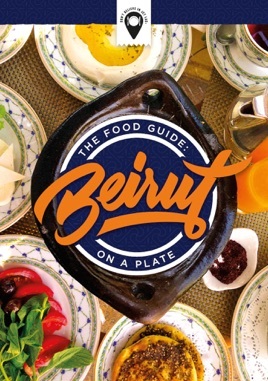 Beirut on a Plate is not your run of the mill food and drink guide. 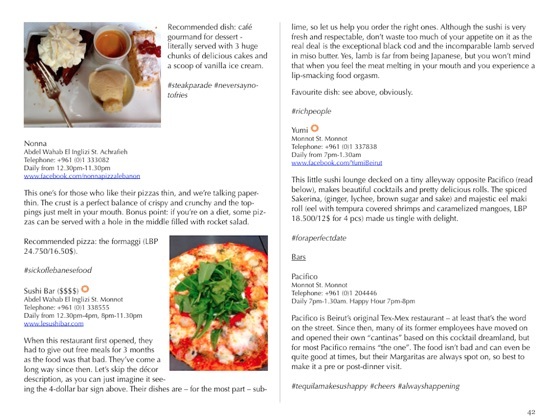 It extends beyond straight restaurant reviews and uncovers the real hidden gems of Lebanon’s capital. 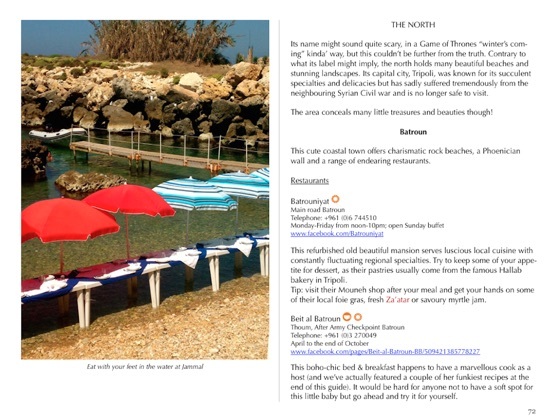 The pages will take you anywhere from open air markets bursting at the seams with colour to delectable food shops tucked away in Beirut’s forgotten corners. As you set out off the beaten track, the guide highlights local history and culinary customs to help you discover Lebanese culture through your stomach. Since taste is a sense particular to the individual, you can craft a trip that is authentically catered to you. Promising first title in what I hope to be an ongoing series of travel guides based around food. 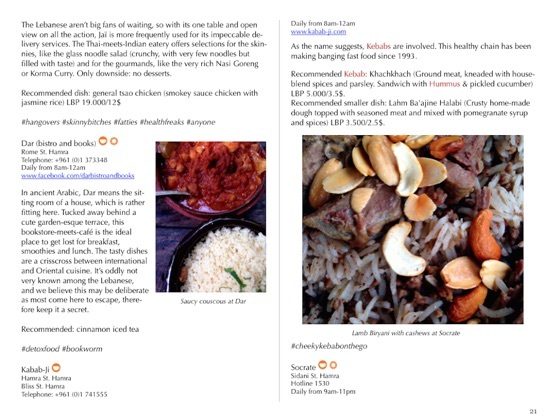 The authors seem to buy wholly into the "tell me what you eat, I'll tell you who you are" school of thought, embarking us on a tour of lebanese culture and lifestyle through the portal of food. 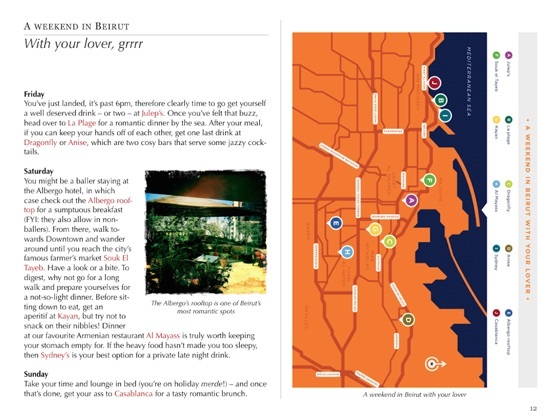 Makes you want to travel, and traveling makes you hungry, so this guide is perfect.